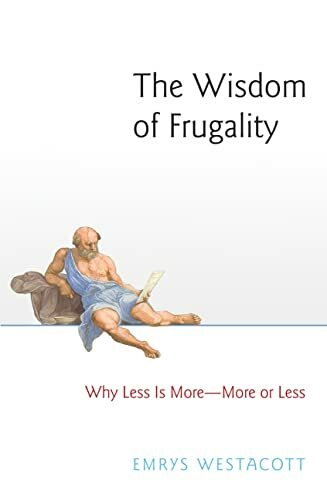 The Virtue of Frugality, by Emrys Westacott, is an informed contribution to the literature devoted to understanding human nature. This literature has an illustrious membership list. For instance, almost a century ago, Solomon Asch, a social psychologist attempted to identify traits that shape first impressions. He found that if a list of adjectives purportedly describing a stranger differed from another list by one single critical adjective, such as cold versus warm, the impression that people had of the stranger would be considerably more or less positive, depending on whether warm or cold was on the list (1946). Since then, several studies of impression formation and more broadly personality traits have confirmed that individual differences may be captured by pairs of adjectives, each pair representing opposite dimensions of our being human. By the same token, in the vocabulary of everyday life, labels are used to cluster actions, values, thoughts, feelings, and beliefs into dispositions that allegedly define the core of a person's existence. As per personality traits isolated through the application of the scientific method, such key labels are often used to define us and others, including our actions and relationships, in ways that are consequential, albeit the underlying concepts are more nebulous. Frugality is undeniably one of these terms. As it may be expected, it has several close synonyms and antonyms expressing two contrasting ways of being. Its denotation and connotation may fluctuate, depending on the cultural, societal, political, and historical idiosyncrasies of the context experienced by the user. Yet, even though the concept of frugality does not possess the precision and uniformity of a personality dimension (e.g., introversion versus extraversion), it describes a key aspect of the way we live (or intend to live). Not surprisingly, in The Virtue of Frugality, Westacott first examines the defining properties of the meaning of this word, and of its close companion, simplicity, through synonyms, and antonyms. Then his narrative moves into ordinary and more scholarly uses of the term frugality, as particular ways of acting, thinking, and feeling, and their consequences. His intent is to remain objective while he scrutinizes some popular beliefs, such as the association between frugality and happiness or the conception of frugality as a moral virtue. He also investigates the opposite of thriftiness, not only as a concept, but also as a way of being, either adopted or merely envisioned, and its consequences if adoption is realized. His focus remains frugality though. In the end, the author's dialectic craft is applied to environmental concerns. The promise of objectivity made in the introductory section of the book appears to be only one aspect of the author's motivation to write about frugality. In fact, his goal is to answer a key question that is likely to be in the mind of most of his readers. Namely, if there are disadvantages in opulence, either possessed or merely desired, why have so many human beings failed to embrace frugality and even actively pursued its opposite, including material wealth and extravagant consumption? In fact, it stands to reason that if frugality is both a virtue and a harbinger of happiness, it should be the flagship of human societies across the ages. The issue that the author faces is that this query targets those who possess key resources and can indulge in some form of opulence. These individuals tend to be concentrated in specific areas of the world, but even in such areas, exceptions exist. For instance, Edward N. Wolff, an economist at New York University, recently reported that the wealthiest 20% of USA households own 90% of the country's wealth (2017a, 2017b). According to the Organisation for Economic Cooperation and Development (OECD), the wealthiest 1% of the USA households own 40% of its assets with a somewhat reduced but similar pattern in several other countries (2015). If one merely considers that access to quality education is limited to people from poor households (OECD, 2015), a growing pattern of wasted potential and lower social mobility emerges. Yet, the evidence of economic inequalities found in scholarly reports brings to the forefront a host of other issues that insult human dignity, including unabated misery, exploitation of others, etc. Thus, the key question that Westacott asks may need rephrasing if objectivity is to be achieved. Asking why frugality has not become the prevailing mode of living reflects a partial view of humanity as it does not recognize that the question has a different answer depending on whether the respondent is powerless or has some degree of control over his/her life. The powerless lack resources. Their destiny is in the hands of forces whose identity and reach are often impossible to fathom in the quotidian existence of the communities in which they reside. Thus, in my modest opinion, the key question of The Virtue of Frugality must contain a what rather than a why. Namely, if the idea of an equitable distribution of resources is contemplated, what are the boundaries of acceptable frugality for all people? Then, additional questions, more in the realm of psychological mechanisms, may arise. Yet, notwithstanding this issue, the author's narrative integrates different viewpoints of the philosophy of frugality and its opposite, the philosophy of consumption. This approach illustrates his explicit intent to be inclusive. Overall, the book is an interesting and valuable read for all who are considering quality of life issues not merely for themselves but for everyone living on planet earth. It encourages the reader to reflect on the tenets of the philosophy of frugality as if looking at a famous painting that he/she has yet to fully appreciate. While reflecting on the contents that the author expertly examines, the reader can gather a deeper understanding of the beliefs, values, and practices of consumerism, and is given the opportunity to analyze the sensibility of alternative ways of living. Most importantly, it is a narrative that inevitably leads the reader to consider his/her idiosyncratic notion of frugality as a value in one's daily existence and as a concept that defines the boundaries of prudent consumption. This focused self-examination may result in a broader and more equitable consideration of the concept not only in one's own culture and society, but also across the globe where needs and resources differ, and exploitation has left scars unlikely to be healed in the foreseeable future. One may argue that the topics and issues discussed in The Virtue of Frugality are well known. Yet, the author's skillful narrative condenses them in an engaging read, a careful and artful reminder that they are too important to reach saturation. Asch, S. E. (1946). Forming impressions of personality. The Journal of Abnormal and Social Psychology, 41(3), 258-290. Organisation for Economic Co-operation and Development (2015). In It Together: Why Less Inequality Benefits All. Retrieved from https://doi.org/10.1787/9789264235120-en. Wolff, E. N. (2017b). A Century of Wealth in America. Cambridge: MA: Belknap Press.